Perhaps the most important part of the whole Tomb Raider experience is the lighting. 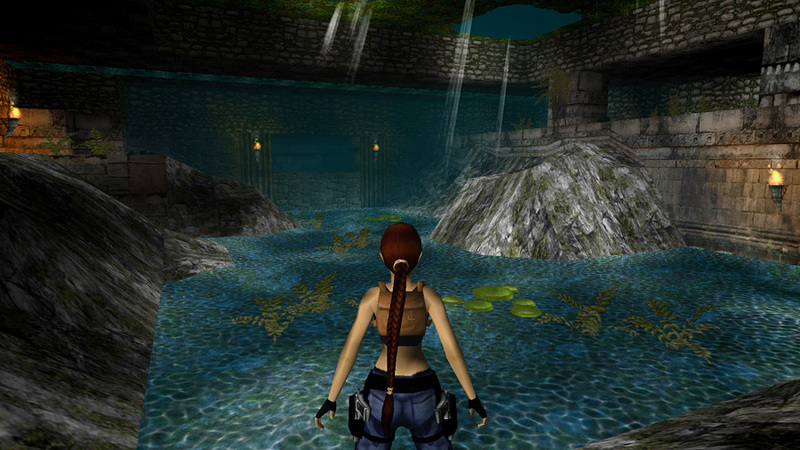 Without careful lighting, there is no atmosphere, and without atmosphere there is no Tomb Raider. It isn't about darkness and nor is it about brightness. It is about atmosphere. There are no 'rules' to lighting as such, and every game will have different lighting. The textures you pick, the time of day you set your adventure, the location of your story and many other factors will affect your lighting. The best I can do in this introductory tutorial is suggest a few ideas I use frequently to get you started. First build your room and texture it. There will be no lighting applied at all and the room will have the editor standard starting ambience of 128,128,128. In the editor and in game the room will look flat, dull and lifeless. No one would enjoy Raiding in an atmosphere like that. Even Lara herself is bland and lifeless. We need to start work on the lighting. Like I said, the following methods I use are not rules. This is simply how I work and you will no doubt discover far better methods which are infinitely more effective. For complete beginners just learning the editor, these suggestions should get you going building some reasonable rooms with a little atmosphere. The first thing I do is turn the room ambience down to 32,32,32. Then I put a sun bulb in, adjust the X axis to 20 so the sun lights a part of the floor, the Y axis I spin round until I find the best effect, and I decrease the sun's intensity to around 0.25. Even with these simple adjustments you will notice big improvements In game. 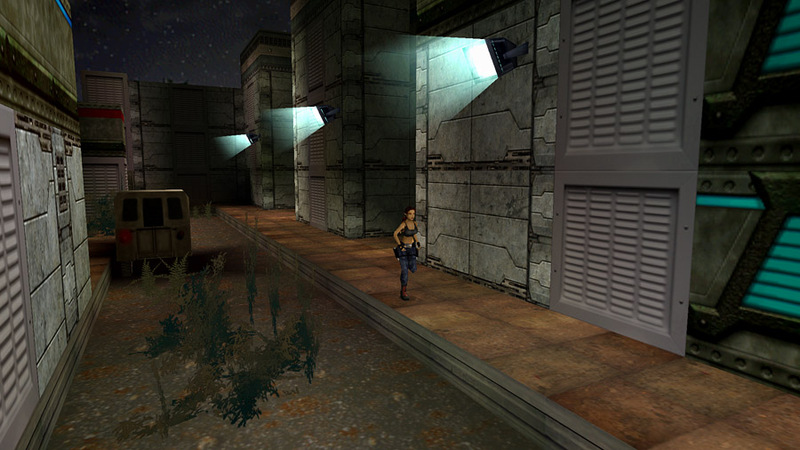 Your room will have a little atmosphere and Lara will have a lovely silky 3D sheen about her skin. Always, always, always put a sun bulb in every room so Lara has this gorgeous 3D sheen about her. To be honest, however, your room will still be rather flat, plain and dull. From this basic starting point, I use three methods to liven up an area. The first is flame emitters. You can also use simple bulbs coloured red or yellow with their radiance diameter reduced to around 2 from 5 and their intensity softened to give the flames more of a natural glow. 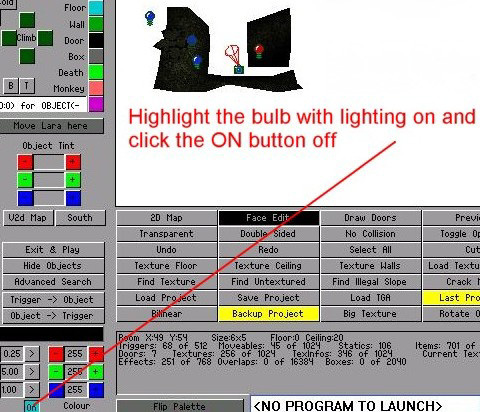 Highlight the bulb by clicking on it and then click on the red or yellow colour in the colour palette. In game the room is much improved. My second method is water. Adjust the water room to say 0,0,32 for a bluish water or 0,32,0 for greenish water and have fun experimenting. A simple bulb plopped on the surface and turned the colour of the water will enhance the effect. Don't forget to hit the R (reflection) button so the dry room will cast a lovely reflection from the water (the numbers 1 to 4 increase the intensity of the reflection). This is a perfect way to highlight a dull room. My third main method is to open the roof and let some light in from the sky, whether sunlight or moonlight, or to use artificial lights say around buildings. 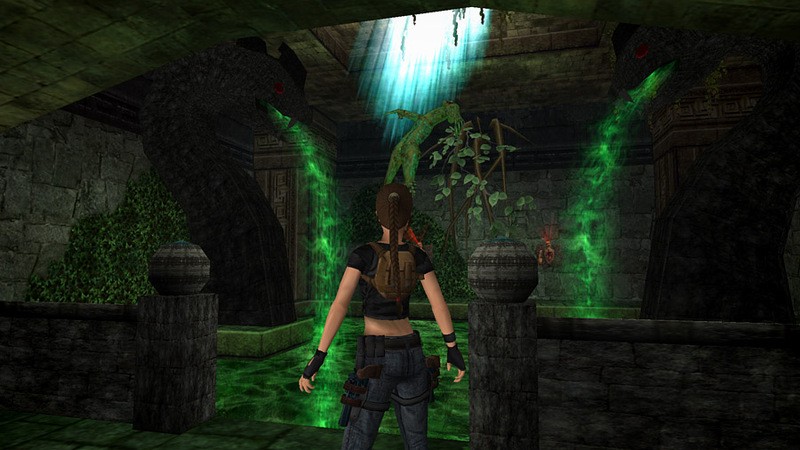 This can be very dramatic, especially in darkish levels like caves or jungles or levels set at night. A bulb placed on the ceiling or wall where the light object shines down and one on the floor to simulate light hitting the ground can produce some lovely effects. Not only that, but it brightens the game while keeping the illusion of darkness. Perhaps now you begin to see how you can produce dark levels which are bright. This is an art and your skills will improve the more you practice and learn. 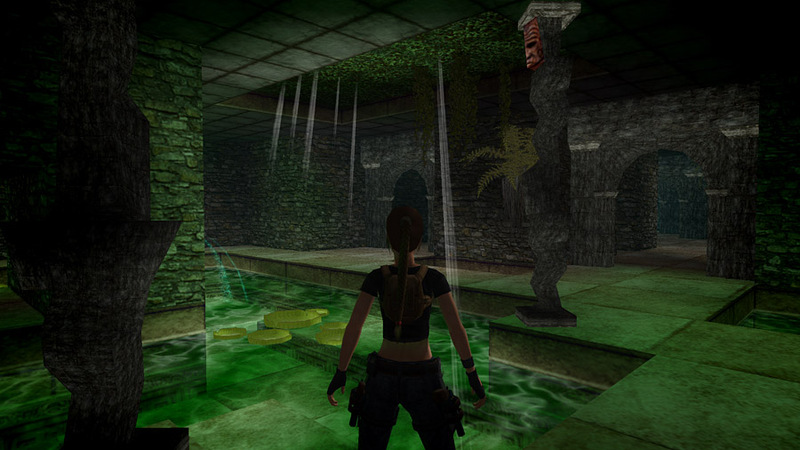 And, of course, you can mix all these effects to produce some incredibly atmospheric rooms, like this one from Jungle Ruins - The Return. 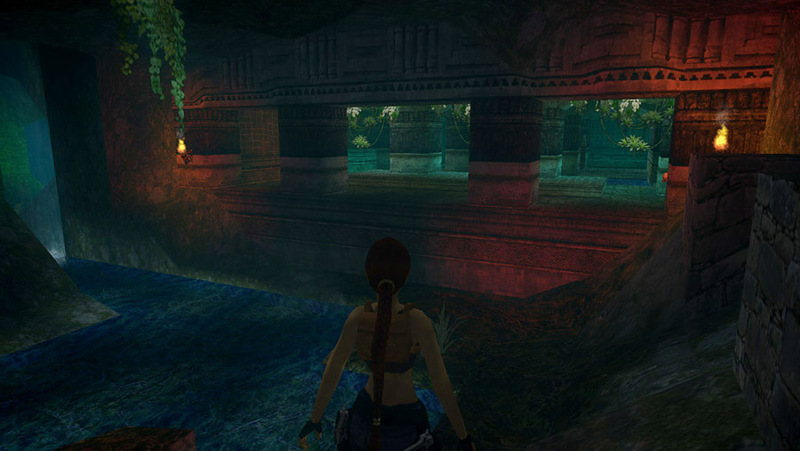 Ever noticed Lara can suddenly flash with bright light while running through a dark area? This can be easily fixed once you understand what causes it. Lightbulbs and the sun affect objects as well as the environment. So when mixing light bulbs with shadow bulbs objects can sometimes shine with the light from the bulb where the arcs for both the light bulb and shadow bulbs cross. The fix is to click on the light bulbs in those corners and click the ON button OFF. This in effect makes light bulbs have no effect on objects and they will only light the environment. However, don't use this except to cure this bright flashing problem as objects need this extra lighting for ambience and atmosphere. Switching this function off is also useful when using shadow bulbs, say for example, under a jeep in bright daylight. The shadow bulb switched off will put shadow on the ground under the jeep but there will be no shadow on the actual vehicle. When adjusting the lighting of rooms, you can adjust the colour settings incrementally all together without having to do them one at a time. This is especially useful if you have the colour shading perfect, but it's too dark or too light and you don't want to lose the overall colour balance. It is also very useful when starting with a brand new room which has the lighting fully up. You can lower all three colour tints simultaneously. Saves heaps of time and cuts the frustration factor considerably. Simply hold down the Alt key while adjusting the light settings with your mouse.